The Dangers of Nuclear War: A Pugwash Symposium, by Franklyn Griffith and John C. Polanyi. - book suggestion. Born 23 Jan 1924; died 17 Jul 1998 at age 74. Waves in Fluids, by James Lighthill. - book suggestion. Japanese physician and physicist who shared the 1949 Nobel Prize for Physics for “his prediction of the existence of mesons on the basis of theoretical work on nuclear forces.” In his 1935 paper, On the Interaction of Elementary Particles*, he proposed a new field theory of nuclear forces that predicted the existence of the previously unknown meson. Mesons are particles heavier than electrons but lighter than protons. One type of meson was subsequently discovered in cosmic rays in 1937 by American physicists, encouraging him to further develop meson theory. From 1947, he worked mainly on the general theory of elementary particles in connection with the concept of the “non-local” field. He was the first Japanese Nobel Prize winner.«*Proc.Phys.-Math. Soc.Japan, 17, p. 48. Tabibito (The Traveler), by Hideki Yukawa. - book suggestion. Born 23 Jan 1888; died 22 Aug 1985 at age 97. German physicist and crystallographer whose theory of X-ray interference by crystals was the first detailed, rigorous theoretical explanation of the diffraction effects first observed in 1912 by his fellow physicist Max von Laue. Born 23 Jan 1876; died 7 Mar 1954 at age 78. Otto Paul Hermann Diels was a German organic chemist who with Kurt Alder was awarded the Nobel Prize for Chemistry in 1950 for their joint work in developing a method of preparing cyclic organic compounds. His most important work concerned the diene synthesis, in which organic compounds with two carbon-to-carbon double bonds were used to effect syntheses of many cyclic organic substances under conditions that threw light on the molecular structure of the products obtained. This method was developed (1928) in collaboration with Kurt Alder, his student, and is known as the Diels-Alder reaction. Their work proved especially important in the production of synthetic rubber and plastics. Born 23 Jan 1876; died 2 Mar 1960 at age 84. 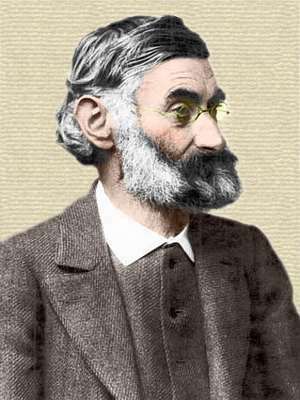 German mathematician who reduced geometry to a series of axioms and contributed substantially to the establishment of the formalistic foundations of mathematics. In his book, Foundations of Geometry, he presented the first complete set of axioms since Euclid. His work in 1909 on integral equations led to 20th-century research in functional analysis (in which functions are studied as groups.) Today Hilbert's name is often best remembered through the concept of Hilbert space in quantum physics, a space of infinite dimensions. The Theory of Algebraic Number Fields, by David Hilbert, I.T. Adamson. - book suggestion. Born 23 Jan 1857; died 18 Dec 1936 at age 79. Croatian meteorologist and geophysicist who discovered the boundary between the Earth's crust and mantle, a boundary now named the Mohorovicic discontinuity. In 1901 he was appointed head of the complete meteorological service of Croatia and Slavonia, he gradually extended the activities of the observatory to other fields of geophysics: seismology, geomagnetism and gravitation. After the Pokuplje (Kupa Valley) earthquake of 8 Oct 1909, he analyzed the spreading of seismic waves with shallow depths through the Earth. From these, he was the first to establish, on the basis of seismic waves, a surface of velocity discontinuity separating the crust of the Earth from the mantle, now known as the Mohorovicic discontinuity. Born 23 Jan 1840; died 14 Jan 1905 at age 64. Born 23 Jan 1814; died 28 Nov 1893 at age 79. British army officer and archaeologist who excavated many sites in India, including Sarnath and Sanchi. He retired (1861) as a major general after 30 years of service with the Bengal engineers and then was the first director (1861–65, 1870–85) of the Indian Archaeological Survey. In the 13th century, India's flourishing network of temples and monasteries was wiped out by invading armies, overgrown by forests, buried in humus, and forgotten. When Cunningham made it his mission to locate and dig them up again, in many cases all he had to go on were the accounts written by Fa Hien and Huien Tsiang and the occasional tip of an Ashokan pillar protruding from the earth. He wrote about the tradition of Kangra plastic surgery operations. Born 23 Jan 1796; died 24 Mar 1864 at age 68. Born 23 Jan 1785; died 28 Jan 1859 at age 74. Born 23 Jan 1719; died 15 Jan 1790 at age 70. British mathematician who made important contributions on elliptic integrals. As a trained surveyor and land agent (1762-88), Landen's interest in mathematics was for leisure. He sent his results on making the differential calculus into a purely algebraic theory to the Royal Society, and also wrote on dynamics, and summation of series. Landen devised an important transformation, known by his name, giving a relation between elliptic functions which expresses a hyperbolic arc in terms of two elliptic ones. He also solved the problem of the spinning top and explained Newton's error in calculating the precession. Landen was elected a Fellow of the Royal Society in 1766. He corrected Stewart's result on the Sun-Earth distance (1771). Born 23 Jan 1693; died 18 Feb 1750 at age 57. German philosopher, mathematician, statesman, and author of treatises in astronomy, physics, botany, and theology. He is best known for his Leibniz-Wolffian philosophy, a term he coined to refer to his own position midway between those of the philosophers Gottfried Wilhelm Leibniz and Christian Wolff. Died 23 Jan 1961 at age 74 (born 8 Feb 1886). Roman Catholic priest and cultural anthropologist who advocated a comparative, historical approach to understanding cultural phenomena and whose investigations of hunting and food-gathering tribes produced theories on the origin and development of society. Died 23 Jan 1864 at age 70 (born 30 Nov 1793). German physician whose attempts to establish medicine as a natural science helped create modern methods for the teaching and practice of clinical medicine. Schönlein was the first to use the microscope in conjunction with urine and blood analyses to diagnose disease. He coined the term hemophilia (1828), was the first to describe purpura rheumatica (1837, hence called Schönlein's disease) and discovered fungus causing favus (1839). Died 23 Jan 1810 at age 33 (born 16 Dec 1776). German physicist who discovered the ultraviolet region of the spectrum (1801) and thus helped broaden man's view beyond the narrow region of visible light to encompass the entire electromagnetic spectrum from the shortest gamma rays to the longest radio waves. After studying Herschel's discovery of infrared radiation, he observed the effects of solar radiation on silver salts and deduced the existence of radiation outside the visible spectrum. He also made contributions to spectroscopy and the study of electricity. Died 23 Jan 1805 at age 41 (born 25 Dec 1763). Died 23 Jan 1766 (born 1692). Italian philosopher of cultural history and law, who is recognized today as a forerunner of cultural anthropology, or ethnology. He attempted, especially in his major work, the Scienza nuova(1725; "New Science"), to bring about the convergence of history, from the one side, and the more systematic social sciences, from the other, so that their interpenetration could form a single science of humanity. Died 23 Jan 1622 (born c. 1584). In 1964, the first animal to human heart transplant was made. Dr. James Hardy at the University of Mississippi transplanted the heart of a chimpanzee (named Bino) into the chest of Boyd Rush (age 68) in a last-ditch effort to save the man’s life because no human was heart available. The newly-transplanted heart beat on its own; but it was too small to maintain independent circulation and Rush died after 90 minutes. Hardy had to endure some severe criticism. (This was three years before Christiaan Barnard performed the first successful human heart transplant). Hardy also made the first human lung transplant in 1963 and a double-lung transplant that left the heart in place in 1987. In 1960, a specially constructed bathyscaphe, the Trieste, descended 35,810 feet in the Pacific Ocean into Challenger Deep. This, the deepest point known to exist on earth, is in the Marianas Trench near the island of Guam. The Trieste cabin was a six-foot diameter steel capsule weighing 14 tons engineered by Swiss scientist Auguste Piccard to withstand the 16,000 lbs/sq.in. water pressure at that depth. Jacques Piccard (Auguste's son) and Navy Lieutenant Don Walsh made the five-hour descent, setting a deep-diving record. Through their window, they saw a foot-long fish, and thus answered the question of biologists who long wondered whether life could exist at such depths of the ocean. The record has stood unchallenged for 40 years since their historic dive. In 1930, Clyde Tombaugh photographed the planet Pluto, the only planet discovered in the twentieth century, after a systematic search instigated by the predictions of other astronomers. Tombaugh was 24 years old when he made this discovery at Lowell Observatory in Flagstaff, Ariz. In 1896, Wilhelm Röntgen first made a public lecture-demonstration of his X-ray device, in Würzburg, Germany. When the Mississippi Ran Backwards: Empire, Intrigue, Murder, and the New Madrid Earthquakes, by Jay Feldman. - book suggestion. Booklist for New Madrid earthquakes.